The Earth was a publication of the Atchison, Topeka, and Santa Fe Railroad. Its sub heading was "Especially the best part of it--the Santa Fe Southwest." 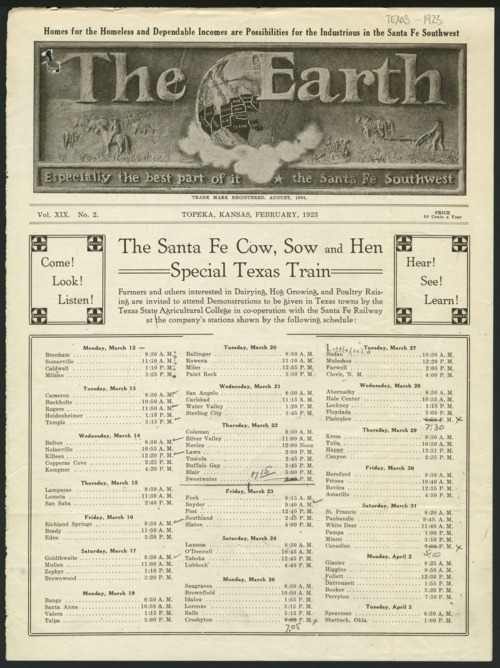 The front page has the schedule for the Santa Fe Cow, Sow and Hen Special Texas train being supported by AT&SF. It was traveling in the northwest part of Texas March 21 through April 3, 1923. It was scheduled to stop in 3 or more Texas communities each day. Page two has an article about the activities of the train and women were specifically invited to attend. There is also an article on page two about the Panhandle Plains area of northwest Texas. The Earth was an ongoing publication of the AT&SF, published in Topeka, Kansas. This issue was Vol. XIX No. 2.